Brand marketing and cause marketing may often have different priorities, first and foremost the objectives of for-profit and not-for-profit. They also have many similarities, the most important being engaging community. Since the inception of social platforms, how brands become and stay successful includes customer involvement; from resolving customer service issues, to product evolution to brand reputation. Social engagement is where much of a brand story evolves and gets told. Communities, not just the brands creating their story, now have a voice and a great deal of power. This shift in community raises a lot of challenges but also a great deal of opportunity for brands. 89% of U.S. consumers is likely to switch brands to one associated with a cause, given comparable price and quality. 64% of Americans are more inclined to support issues offline after first “liking” or “following” an organization online (for millennials, this number is 80%). How can brands engage with communities that support causes their customers care about? Here are 6 Ways Brands Can Engage Communities & Causes. American Express has long been seen as the originator of the field of cause marketing with their 1983 campaign supporting renovation of the Statue of Liberty. They continue to find important places where their brand and their community intersect. They conducted research that found that 75% of Americans believe “passion projects and the idea of pursuing one’s passion is necessary to help live (a) fulfilled life.” Their Passion Project campaign helped fund projects with small contributions towards their entrepreneurial goals. The REI Stewardship initiative states “we believe a life outdoors is a life well-lived.” It’s the perfect place where brand (selling outdoor apparel and equipment) and community (how customers use those products) intersect and they report annually on the value this initiative provides to the outdoor community. Unfortunately, natural disasters happen frequently and the need to help those in need is ongoing. Tide created their Loads of Hope program in response to Hurricane Katrina in New Orleans. P&G continues to show up when hurricanes, tornados and wildfires impact communities. The program anticipates a need before the need even strikes. Nike has long been a supporter of Oregon Health & Science University, a world-class hospital and academic learning center located in Portland, Oregon. Nike collaborated with OHSU to create initiatives to support many OHSU needs including their Doernbecher Children’s Hospital. A program called “Doernbecher Freestyle” was conceived in 2004 by Michael Doherty, Nike’s Creative Director for Global Brand Presentations and a member of the Doernbecher Foundation Board of Directors. In the case of the Nike Freestyle collaboration, the concept started with Doherty’s teenage son. He proposed having Doernbecher’s young patients create and sell a custom shoe. That simple idea evolved into an ongoing program that helps raise money and awareness. Learn about the Doernbecher Freestyle Collection. When Hurricane Katrina hit, Proctor & Gamble wanted to do more than just donate money. 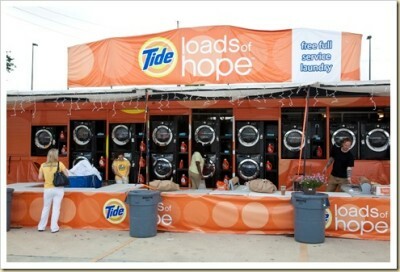 Their Tide Loads of Hope program has washed more than 58,000 loads of clothes for those affected by natural disasters. They have also spearheaded fundraising by selling t-shirts and giving a percentage of proceeds from Tide to communities affected by natural disasters. Nike and OHSU’s collaborative Doerbecher Freestyle program focuses on Nike and patient creativity. Working with Nike’s top creative talent, the patient-designers use their shoes to express powerful personal messages about their lives and their hopes for the future. The designers spend time on the Nike campus and meet design mentors sketch designs collaboratively. The patients are at the center of the design process — deciding the colors, materials and details for each shoe to reflect their individual personalities and life experiences. The REI 1440 Project curated 1,440 images that illustrate the 1,440 minutes of an entire day. This campaign was wildly successful because it allowed customers to share their creativity around the REI way of life. Though the project wasn’t technically a “cause”, it was a nod to the cause of staying happy and healthy by spending time outdoors. -It raises awareness by sharing hospital needs such as pioneering medical breakthroughs, helping cover the cost of care for families or testing new treatments for serious childhood diseases. -It empowers the community it serves. The kids who collaborate to create the Doernbecher Freestyle shoes and apparel are also benefitting their fellow patients by raising money for the hospital. -It engages other partners. As it has evolved it also includes other brand partners to share the message and grow the campaign, Doernbecher Freestyle shoes and apparel created in their project are sold on eBay. Rather than embrace a new cause annually, it can be effective and more efficient to embrace and stick with a cause. Tides Loads of Hope shows up in disaster areas to help serve a basic fundamental need in the face of a catastrophic event, the need for clean clothes. Though REI does a lot more on their social platforms than curate customer images, the concept of curating their customers outdoor experiences is central to their ongoing brand story. The Nike and OHSU collaboration called Doernbecher Freestyle has spanned 11 years and has generated more than $8M. At the end of the day, brands that engage communities to support a cause must do it for the right reason. Community activists can sniff out insincerity and if your participation isn’t heartfelt it won’t last for long and could even garner backlash. Long-lasting communities can only endure when brands truly believe in, invest in and support the cause. It’s obvious that REI doesn’t just give lip service to stewardship, it’s a core tenant. Nike support of OHSU goes beyond the Doernbecher Hospital and extends to many parts of their mission, most recently in creating The Knight Challenge. Their Cancer Institute (now The Knight Cancer Institute) is raising $500 million and will have a total of $1 billion when they reach that goal thanks to a matching gift from Nike co-founder Phil Knight and his wife, Penny. What is your brand doing to engage your community and their most cherished causes?